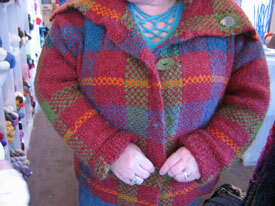 And finally we get a glimpse of Kimberly's finished tartan jacket from last year's Fall Interweave Knits. Wowza! 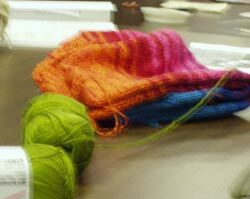 Kimberly also brought in an adorable baby hat she just finished and the beginnings of her first sock! 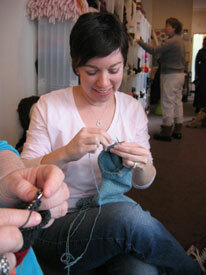 Kimberly's friend Angela (from yarngirls) was visiting and came round to knit with us. She was working on the hourglass sweater from Last Minute Knitted Gifts in Classic Elite's Posh yarn. Holy softness, yarn girl! 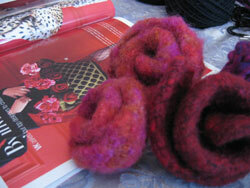 Kimberly's working on the fabulous rose/trellis bag pattern from the Spring Vogue Knitting. This bag is SO Kimberly! 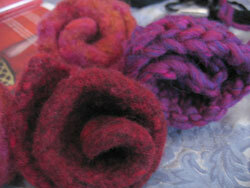 The left two flowers are felted; the right is prefelting. Isn't it amazing how nicely the flowers felt up? Since Kimberly hasn't been able to post pics on her blog, I'm posting this here. Because you have to see it! 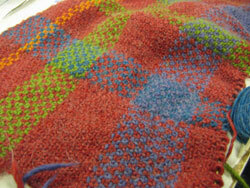 It's the tartan jacket design from Interweave Knits Fall 2004. Wowie! Is that a (blurry) cardi raye I see down the table? Yup, fellow Knitsmith Kimberly is also working on the famed cardi raye. And she IS a sparkle girl!